The leaves provide a wonderful flavor and compliment to any sandwich but we all really enjoyed it on both tuna and chicken salad sandwiches. Let me tell you something- I don't think you really even need condiments on your sandwiches when you use these greens. Since the flavor is so deliciously strong, I actually used these in place of horseradish for a sausage and pepper dish and it was divine. Apparently, these greens are happiest in the cool spring or fall conditions. 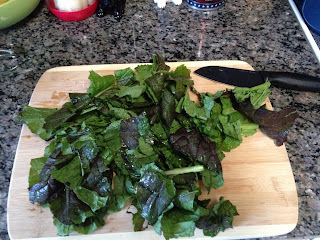 This is exciting to me as I plan my fall garden because the greens I planted in the springtime flourished all the way through the month of June in North Carolina. I intend on planting a whole bunch more of these because I want to have them on hand at all times. That is how good these are. I also like how greens are high in Vitamin A and Vitamin C. If you want to add some pizazz to your veggie routine or spice up those sandwiches as the back to school grind begins, give these greens a try! 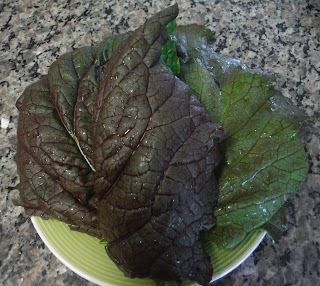 Use these delicious greens on sandwiches or for lettuce wraps.